The empowerment is on Friday, 8/9 at 7 pm and the practice instructions are on Saturday, 8/10 at 10 am and Sunday 8/11 at 10 am and 2 pm. The location is Ewam Choden. PREREQUISITE: Due to the high level tantra of the Uncommon White Tara empowerment, we have been notified that all participants need to have received a major, two day empowerment in any of the four Tibetan Buddhist traditions. (no exceptions to this) If you have questions concerning this prerequisite, please contact Sakya Dechen Ling. Please REGISTER by following the link to Sakya Dechen Ling. Khenpo Migmar Tseten returns to kindly offer teaching on the Prajna Paramita– the Heart Sutra. The event is a two-day retreat including meditation sessions guided by Khenpo Migmar. The sessions are from 10:00 am to 5:00 pm each day, with a break for a pot-luck lunch. The retreat starts with the 16 Arhart Puja dedicated to the long life of Lama Kunga Rinpoche on Saturday morning. The registration donation is $100.00. Pre-registration is NOT required but always encourgaed. THIS IS A SPECIAL OPPORTUNITY THAT IS NOT TO BE MISSED. The Heart Sutra is the essence of Buddha’s wisdom training to realize the right view to guide the meditation and conduct in the right direction to go beyond. The sutra explicitly shows the right view and implicitly gives instruction on meditation, how to make that right view a personal realization. 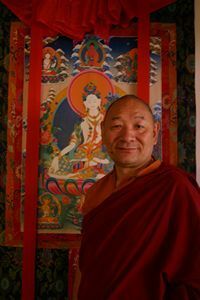 Khenpo Migmar will give the teaching and lead meditation in English, based on the original Sanskrit and Tibetan materials. Khenpo Lama Migmar is a Buddhist chaplain at Harvard University. He leads retreats at Buddhist centers throughout North America. He founded the Sakya Institute in Cambridge, MA, and has served as the head of the Sakya Retreat Center in Barre, MA. He also served as the head of the Sakya Center in Rajpur, India, and the Sakya Monastery in Puruwalla, India, from 1981 to 1989.